We've all been waiting for months and finally the year's first major is just a week away. Players, fans, media and manufacturers are all making plans for Masters week and dreaming of what will happen and who will be involved on the back nine on Sunday. As we all know, clothing is one of the most important piece of equipment. 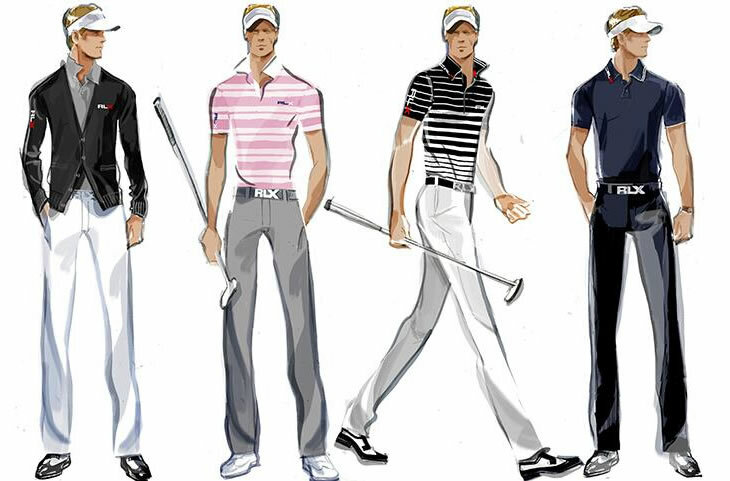 Clothing brands and players decide on styles and colours months in advance to ensure the outfits are eyecatching, in fashion and in shops around the time the players are wearing them. 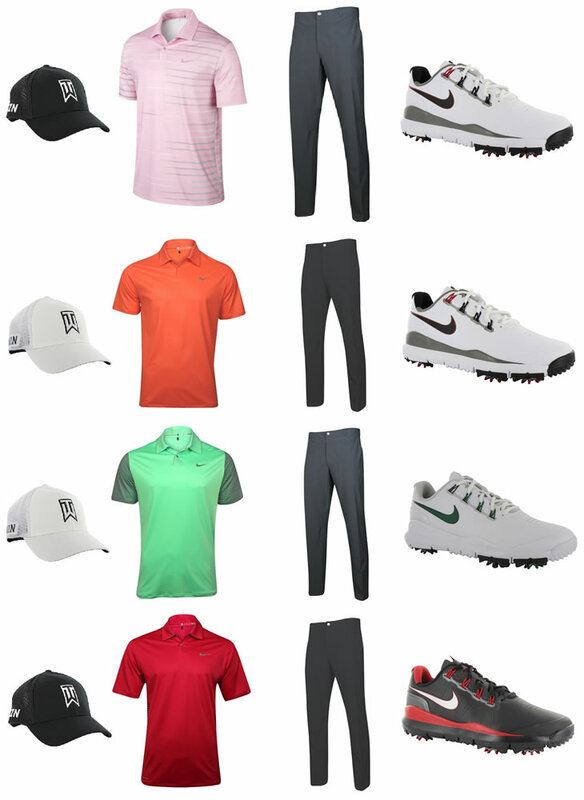 We've been sent the 2014 Masters scripting for several of the game's best and most colourful players (yes, Rickie Fowler is included!). Take a look and let us know which you think are the best and worst outfits. Whether or not Caroline Woznacki has Rory reading 50 Shades Of Grey is unclear, but what is clear is that his Nike outfits have plenty of grey in them. 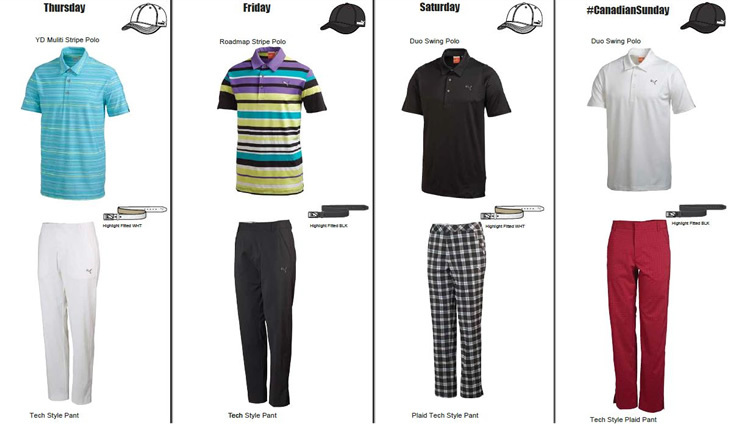 The Masters favourite is planning four relatively simple looks as he tries to pick up his third major championship. Beyond his pink-coloured driver, the 2012 Masters champion has a colourful personality and a colourful set of Oakley outfits for this year's event, including a nice touch of Augusta-yellow on Thursday and Friday. 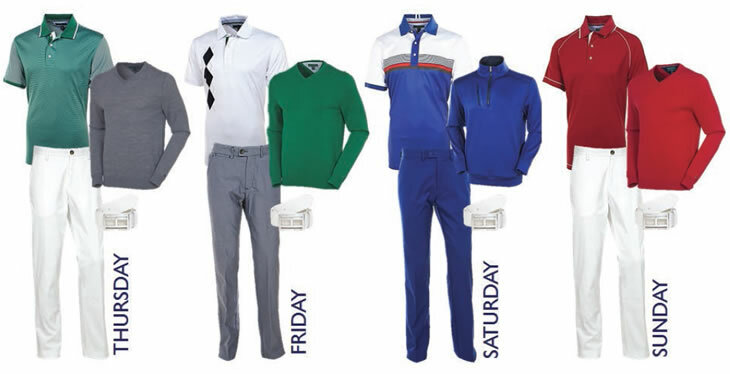 One of the sharpest dressers on Tour, Luke Donald has four relatively understated looks lined up for Augusta, which perhaps mirrors his game. Of course, he will be rocking his signature-look visor each day. Bradley has only played nine major championships, but he already has a PGA Championship trophy on his mantlepiece. 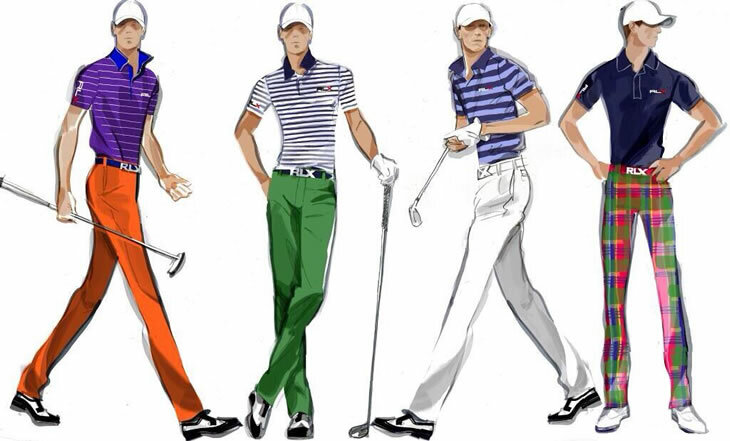 Here's the Tommy Hilfiger looks he'll be sporting down Magnolia Lane this week. Keegan also tweeted a photo of his eyecatching, green, Masters shoes. 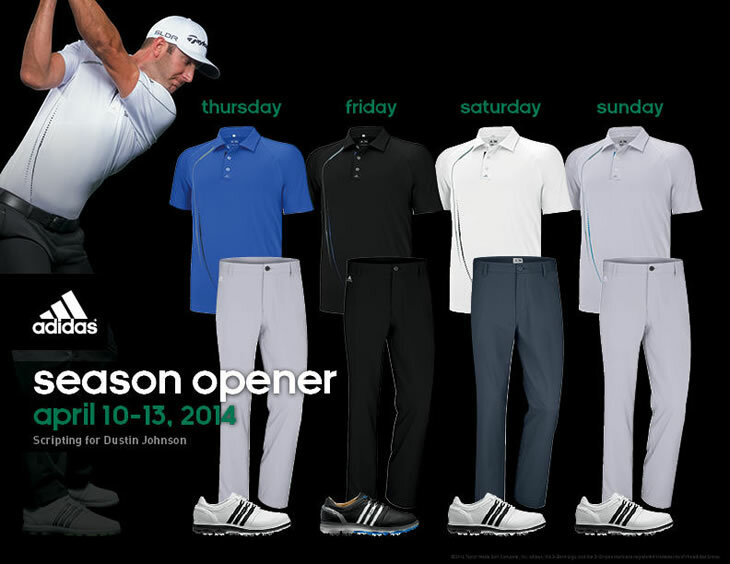 Last year's first round leader will be hoping to grab the lead next week dressed in these Adidas Golf threads. Sergio will be featuring a nice splash of pink Thursday and Friday along with a few different shades of adidas adizero one shoes. He may not be the bookies favourite for the Masters, but he is the favourite of many golf fans, particularly the younger generation. 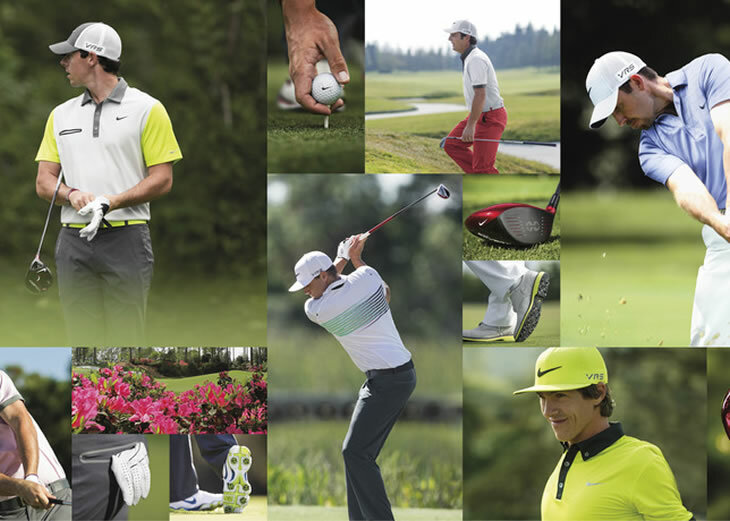 Known for his colourful Puma outfits, Rickie is not disappointing with this bright selection. He is also the only player sharing his practice round outfit. No golf-clothing blog would be complete without Ian Poulter. Now wearing his own brand, Poulter's IJP Design, Masters outfits have his usual splash of colour and plaid. He even has a little Tiger-esque black and red planned for Sunday. The young Texan started 2013 ranked 809th in the world. Since then he has lit up the golf landscape and now ranks 13th and is 40/1 to be wearing a green jacket next Sunday night, which may clash with the green Under Armour polo he has planned for the final round. 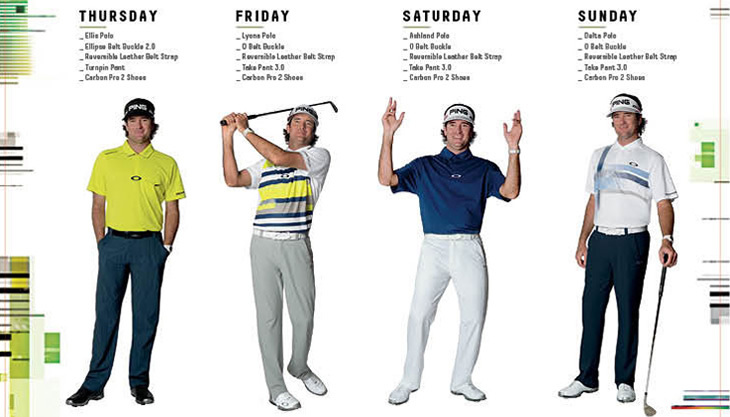 With a swing like Dustin Johnson's, you need your clothes to be more flexible than colourful. 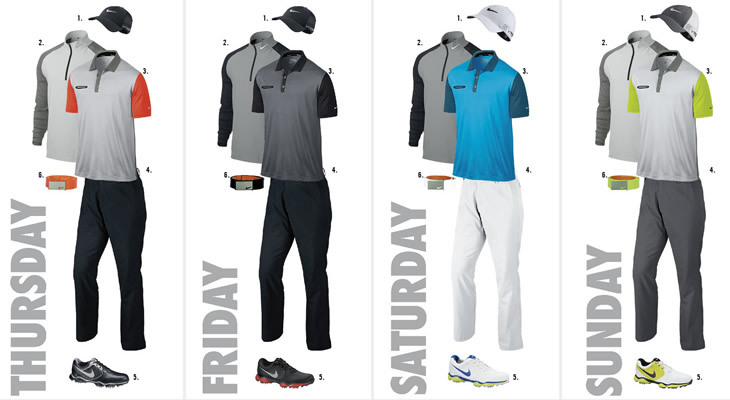 Thus, the big-hitter and Adidas Golf have opted for four simple looks for Augusta, with an all-grey look for the final round. 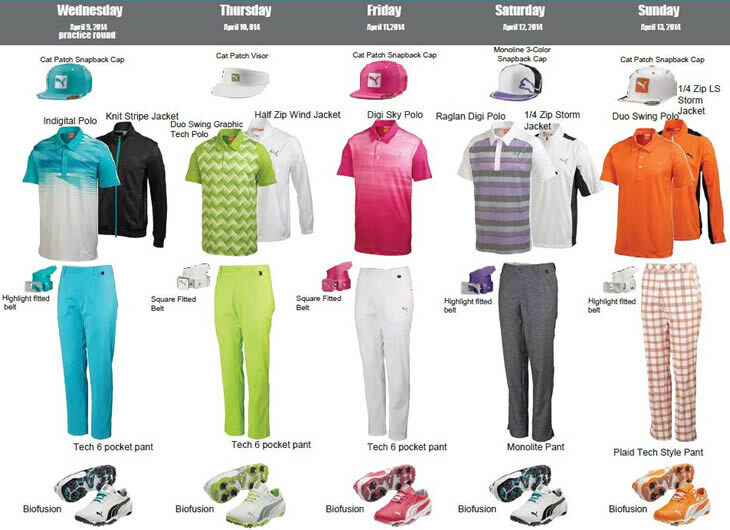 Having signed with Puma Golf this season, Delaet has not shied away from bright and bold colours. He has a couple of eyecatching outfits for the opening rounds and his signature #CanadianSunday look planned for Sunday. The young American appears to be trying to wear as many colours as possible this week, finishing with a splended pair of Ralph Lauren tartan trews on Sunday. Considering Horschel did were a pair of Octopus-detailed trousers at the US Open last year, we shouldn't be surprised at his eyecatching looks this year. The 2010 Masters champion prefers to make headlines with his scores rather than his outfits. 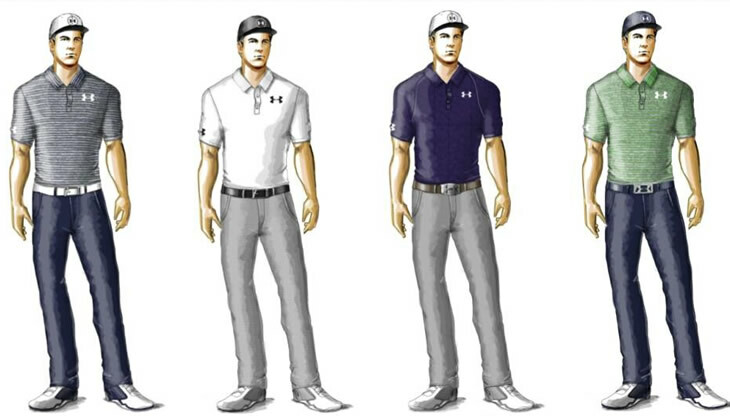 Thus, he and Oakley have four simple, understated looks planned for Augusta this year. In his only two finishes at Augusta, Jason Day has finished 2nd and 3rd. 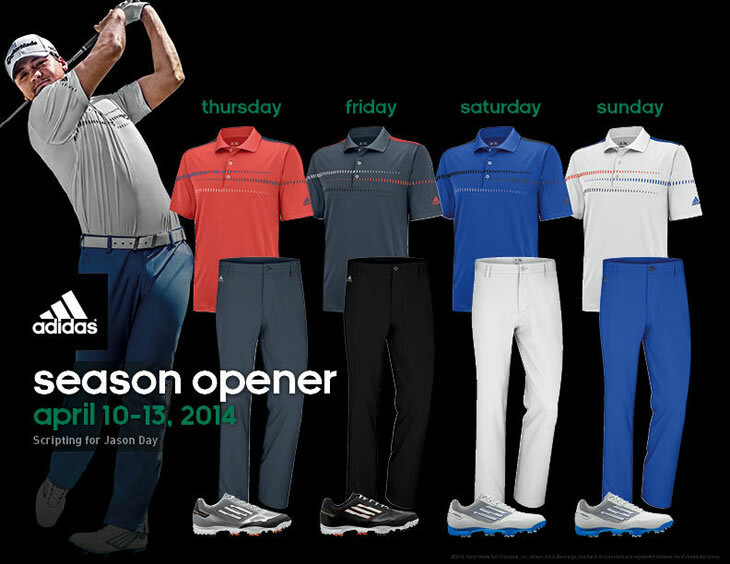 He'll be looking to beat both those results this year and he'll be looking sharp in these Adidas Golf outfits. Will we see those bright, blue trousers paired with a green jacket next week? 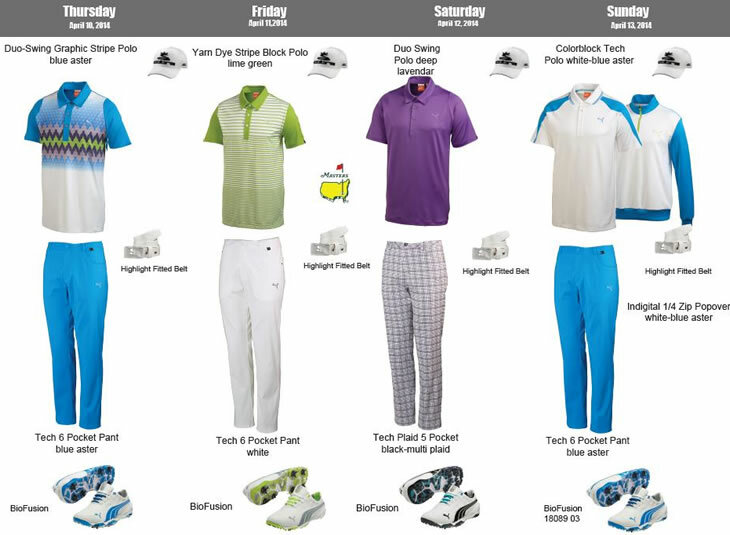 We couldn't not share Blixt's wardrobe for next week. The young Swede is normally easy to spot on the course and his outfits for his first visit to Augusta reflect just that. Apparently he and Puma believe it'll be cold on Sunday, hence the additional layer. Sadly for golf fans, Tiger won't be playing The Masters this year. Back surgery means the Augusta field will not feature the current World #1 for the first time since 1994. Of course, Nike had planned his outfits and did share what he would have been wearing. Notice the limited-edition Nike shoes he would have been wearing on Saturday. Use the social buttons below to share this article and let us know which outfits you like and dislike.